Attractions on Molokai are as varied as the topography and as relaxed as the island attitude. You will find many of the only-on-Molokai attractions in or near Kaunakakai, the island’s main town. Consult The Attractions Map for more details on these easily accessed places. Use the satellite option for a birds eye view. Description: One of the few remaining royal coconut groves in Hawaii, Kaupaiwa was planted in the 1860s for King Kamehameha V. It was originally covered with more than a thousand coco palms on about 10 acres of beach-front land and the remaining several hundred are still an impressive sight. Location: About 1/2 mile west of Kaunakakai on the Maunaloa Highway (460). Description: Molokai’s Lifeline for almost all goods arriving on or shipping from the island. Half a dozen charter boats operating on the island are berthed here and it’s a favorite spot for sunset watching, walking, jogging, swimming and fishing. Facilities: Restrooms & Showers. Small boat launch ramp. Location: About 1/2 mile south of Kaunakakai on Wharf Road. Turn makai (toward ocean) at the Chevron Station from the highway. Description: About every other Saturday morning in June and July, the Molokai canoe clubs compete in outrigger canoe races. The races pit paddlers against each other in 6-man/woman canoes by age group categories ranging from young teen agers to seniors and masters in the 50+ age groups. Location: About 1/2 mile south of Kaunakakai on Wharf Road. Turn makai (toward ocean) at the Chevron Station from the highway. Park anywhere on the west side of the wharf road or in the parking lot by the harbor masters office. Location: 2 1/2 miles west of town (Kaunakakai). As the highway makes a sweeping right turn before going up the hill, look for the entrance on the mauka (mountain) side of the road. Description: With American and Hawaiian flags fluttering overhead and two cannons standing guard, the island’s little war memorial sits in a small triangle park in downtown Kaunakakai. The marble monument contains engraved plaques with the names of Molokaians who have made the ultimate sacrifice defending this country in three wars. Built and loving maintained by the folks of Molokai, this place may unexpectedly touch you. Location: In Kaunakakai, on Ala Malama Street across the post office. Description: Around 10:00pm every night except Monday, the famous Kanemitsu French Bread begins coming out of the bakery’s ovens. At the same time locals and visitors begin arriving at the back door to partake in a Molokai-Only tradition, eating full loaves of hot bread that have been smeared inside with the customer’s favorite sweets. One can choose cinnamon, sugar, melted butter, blueberry or strawberry jam, cream cheese or any combination thereof. Yummmmmmmm. Location: In Kaunakakai. Walk down Hotel Lane, next to Imamura’s, about 50 yards, you’ll see the sign on the left. Walk to and knock on the bakery back door. You may need to knock hard (pound) it’s sometimes difficult to hear inside. Even though a dimly lit alley may seem a little spooky, it is safe. You should have been here when there was no streetlight. Description: Every year from mid-December to mid-April, an estimated 10,000 Humpback Whales arrive from Alaska to the waters around Molokai for their annual Hawaii vacation. These 40-foot giants come here to give birth, mate and generally laze about. They can be observed from shore almost anywhere on the island, but the best locations are on the south side and from the beaches on the west end. Location: Anywhere. If you want a closer look, Molokai Fishing or Molokai Fish and Dive will be pleased to arrange a whale watching cruise for you. At about mile 5 on the Maunaloa Highway (460), the Kalae Highway (470) branches off and heads up the hill toward the village of Kualapuu and onward to cool Kalae. It’s in this area that some of Molokai’s more popular attractions reside. Consult The Attractions Map for more details on these easily accessed places. Description: The only coffee plantation on Molokai is located on the fertile plain surrounding the village of Kualapuu. They have a very nice gift shop and a coffee bar where you can taste the results of their efforts. Worth the trip. Location: Go north on Kalae Highway (470) to the intersection of Farrington Highway in Kualapuu. Turn left onto Farrington and make an immediate right turn into their gift shop parking area. They even have free wireless internet access. Description: The Purdy family has been growing Macadamia Nuts on their homestead for years and have been sharing these delicious treats with visitors and residents alike. Stop by and learn to crack a mac, which is no easy feat. Open 9:30am-3:30pm daily and 10:00am-2:00pm on Saturdays. Location: Follow the Kalae Highway (470) to the intersection with Farrington Highway in Kualapuu. Turn onto farrington, drive about a mile to Lihi Pali Avenue (just before the high school). Turn onto Lihi Pali and follow it about a half mile. Look for a small sign on the right, just past the Congregational Church. Description: The sign at the airport exit announces a Molokai tradition of sending coconut postcards to the folks back home. Stop in at the little Ho’olehua Post Office where the postmaster has a selection of coconuts and marker pens to decorate and address them. Open 8:30am-4:30pm Monday-Friday. Location: Follow the Maunaloa Highway (460) west from Kaunakakai about 6.2 miles and turn onto Puupeelua Road (481). Continue about a mile, look for the post office on the left. Description: The Meyer Sugar Mill, Hawaii’s smallest mill, was built in 1878 and was in operation until 1889. It was built by Rudolph Meyer, who migrated from Germany to Hawaii in 1850. Restored to its original condition over 16 years, the mill was dedicated in 1988. Open 10:00am-2:00pm Monday-Saturday. Location: Follow the Kalae Highway (470) past the village of Kualpuu to about mile 3.5. You will see the mill on the left and its entrance driveway. Follow the drive to the parking area by the Molokai Museum and Cultural Center. Description: One of Molokai’s lesser know attractions is the wonderful golf course in Kalae. This delightful nine hole course is rated at 70 for two trips around at par of 68. It may be the toughest little course you’ll ever play. Outstanding views of both sides of Molokai from the 1500′ elevation. Location: Follow the Kalae Highway (470) past the village of Kualpuu to about mile 3.5. You’ll see a large highway sign on the right and the well marked driveway entrance roughly 100 yards further on the left. Description: The view from 1,600′ above the Makanalua Peninsula is spectacular. 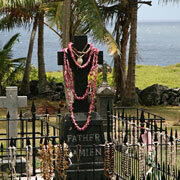 From here you can see the tiny settlement of Kalaupapa where Father Damien ministered to the sufferers of leprosy. Also visible is a small portion of the world’s highest sea cliffs on Molokai’s backside. Location: Follow the Kalae Highway (470) past the village of Kualpuu to its end in a parking lot at the lookout. Walk 100 yards down the path through the Ironwoods to the lookout. Description: Once a place of exile and despair, Kalupapa is today a national historic monument, administered by the U.S. Park Service. Because there was no treatment, beginning in 1866 leprosy sufferers from everywhere in Hawaii were cast ashore here. Saint Damien, Brother Dutton and Saint Marianne dedicated their lives to comforting and educating these afflicted. With the advent of sulfone drugs in the 1940s, the disease was put in remission and the sufferers are no longer contagious. While Kalaupapa is a national historic site, it is also the home of the few former patients who choose to remain there. So access, is by law, strictly regulated. Unless you are invited by one of the residents, you must take the tour offered by Damien Tours of Kalaupapa (about $60.00). The peninsula can be reached by air or by way of the trail descending the 1,600-foot-high (488m) cliffs. You can hike in and out or ride one of the world famous Molokai mules. Visitors must be at least 16 years old. Whether you choose to hike in, fly in or ride the mules, you can book your tour and all other arrangements with the nice folks at Molokai Outdoors or Molokai Mule Ride. To book the tour only, you can also contact Damien Tours by phone 808.567.6171. Why Go? : Kalaupapa is possibly the most beautiful spot in Hawaii with the blue Pacific Ocean on three sides and the magnificent Molokai Pali towering over the peninsula’s south side. The tour offers an insight into the lives and histories of the patients and the works of the care givers. Most visitors return with a sense of awe and a deeply touched spirit. Facilities: Restrooms. Bring drinking water, snacks and lunch. Location: Follow the Kalae Highway (470) past the village of Kualpuu to about mile marker 5, where you will encounter the mule barn on your left. If you’re riding the mules park here. If you’re hiking in, continue another 75 yards where you will see cars of the workers who hiked down before you parked on the right side. Have your car join theirs. The trail begins at the wide gate here. Description: Phallic stones are found all over Hawaii, but this is the finest example. Legend says that if a woman goes to Kauleonanahoa with offerings and spends the night there, she will return home pregnant. Location: Follow the Kalae Highway (470) past the village of Kualpuu to its end in a parking lot at the Kalaupapa lookout. Follow the marked trail about 1/4 mile to the stone. Description: Managed by The Nature Conservancy, the Kamakou Preserve is situated in the remote rain forest of Kamakou near the summit of Molokai’s highest mountain. The 2,774 acre preserve is home to hundreds of Hawaiian plant species, over 200 of which are found nowhere else. Several native bird species also make their homes here. The Maunaloa Highway (460) runs 17 miles from the center of Kaunakakai to the west end village of Maunaloa. Since Molokai Ranch ceased operations, not too many west Molokai attractions are easily accessible or even accessible at all. However, there are still a few unique-to-Molokai places to visit. Consult The Attractions Map for precise locations. Description: Right next to the Maunaloa Post Office is the very unique Molokai kite factory. Windsocks and kites are made from nylon and employ fiberglass spars for the kites and poly tubing for the windsock hoops. Free kite flying lessons are conducted at their “Aeronaughtical Testing Facility” (The park next door). What fun! Location: Follow the Maunaloa Highway (460) west to Maunaloa at mile 17. The kite factory is in the middle of the village next to the post office and across the grocery store. Look for the colorful windsocks. Description: Managed by The Nature Conservancy, the Mo’omomi Preserve is an apparently deserted beach dune area on the north side of Molokai. It is in fact a haven for numerous shore birds and rare coastal plants, many of which grow nowhere else. In addition, there are ancient Hawaiian archaeological sites and evidence of now extinct bird life such as a giant flightless duck, a sea eagle and a flightless ibis. Description: Some for swimming, some for strolling, some for surfing – Molokai’s west end beaches offer something for everyone. See the Molokai Beaches Page or more details and beach-goer cautions. Horseshoe shaped Dixie Maru offers safe swimming almost year round. Papohaku, Hawaii’s longest white sand beach is the perfect spot for a long, quiet beach stroll. Kepuhi Beach – a local surfer’s favorite is next to Make Horse, a beautiful spot to supervise waves in the winter and swim in the summer. Facilities: Restrooms, showers & water available ONLY at Papohaku Beach Park. Location: Follow the Maunaloa Highway (460) to mile 15. Turn onto Kaluakoi Road and drive to its end. There you’ll find Dixie. Coming back you will find Papohaku Beach park then Kepuhi beach and Make Horse. Consult the Beaches Page for info and The Beaches Map to “see” how to reach your beach choice. The Kamehameha V Highway (450) leaves the center of Kaunakakai and traverses the eastern half of the island to the gorgeous Halawa Valley 27 miles beyond. Along the way are several places of interest, mystery and beauty. Consult The Attractions Map for precise locations. Description: Along the south shore of Molokai are the remains of about 60 ancient fish ponds, which provided a stready protein source for the ancient Hawaiians. These ponds are date back to around 13th Century. The walls of the ponds were made from lava boulders and coral and a gate of woven branches kept the fish in while allowing the tide to wash in and out. Some of these ponds are still in use by molokai folks. These are ancient historical sites. Please DO NOT walk on or remove any of the stones. Location: Follow the Kamehameha V Highway (450) east and watch for viewing opportunities along the way. Mile 3 and mile 20 are good locations. Description: In addition to his ministries to the Hansen’s Disease sufferers at Kalaupapa, Father Damien spent time topside on Molokai, building churches and carrying God’s word. Two of these churches can still be visited; Saint Joseph’s Church at mile 10.3, built 1876 and the still-active Our Lady of Seven Sorrows at mile 14.6, built 1874. Location: Follow the Kamehameha V Highway (450) east. St. Joseph’s has an obvious parking lot and you can park on the lawn at Our Lady of Seven Sorrows. Description: The largest and oldest heiau (temple) on Molokai, it is a platform-type heiau about the size of a football field, covering 285X85 feet and 11 to 22 feet tall, which was used for human sacrifice. Legend says that the menehunes built the temple in one night from stones brought hand-to-hand over the mountain from the sea shore at Waiehu, Wailau Valley. Location: Follow the Kamehameha V Highway (450) east. Near mile 16 you will see a gated access road on the mauka side. It’s about a half mile up the road to the heiau. You will be on private land so respect the ‘aina and the heiau. A place of breath-taking grandeur and the home of Molokai’s first residents. During the 7th century, settlers from the Marquesas Islands in southern Polynesia, arrived by canoe and began the settlement of Halawa Valley. For over 1200 years the valley was a center of taro lo’i (patches), heiau (spiritual temples) and a thriving population. In 1836, one of the first missionaries on Molokai reported a population of about 500 Hawaiians farming more than a thousand lo’i and other types of produce in the valley. However, in 1946 and again in 1957, tsunamis (tidal waves) with waves as tall as 45 feet swept up the valley and destroyed nearly all the homes, the taro lo’i and devastated the area. Today the area is primarily a destination for fishing, surfing, picnicking and beach walks. In recent years, a few dedicated residents have begun to reclaim the valley from 60 years of overgrowth by re-establishing taro lo’i and farming tropical flowers. Halawa Stream is the largest of all the streams on Molokai and where it enters the ocean, it divides two beaches; Kama’alaea on the north side and Kawili on the south. The source of this stream is a pair of huge waterfalls at the back of this cathedral valley. Hipuapua Falls is the highest of the two and cascades about 500 feet. The 250′ Moa’ula Falls is the lower and is the perfect example of a Hawaiian waterfall. It ends in a large pool at its base that invites visitors for a cooling swim. Caution is advised however, because legend tells of a huge mo’o (lizard) who reside at the pool’s bottom. Before entering the pool, one must ask permission of the mo’o by floating a single ti leaf on the water. If the leaf floats the mo’o will allow you to share his pool, if the leaf sinks, he is not in the mood for company so you should not enter. IMPORTANT – Because the trail to the falls is across private land and because some outsiders seem to be overly law-suit happy, access to the falls has been for many years, restricted. Visitors may only hike to the falls with a guide on a paid cultural tour. Rates for the 4-5 hour hike and cultural tour vary from $50-75 per person with lesser rates for kids. 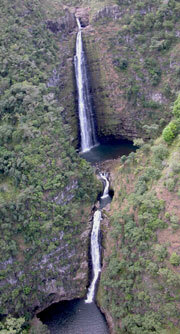 Most visitors mark a trip to the falls as a vacation on Molokai highlight. You can acquire information and tour reservations from the tour desk at Hotel Molokai. Description: The oldest inhabited location on Molokai, the Halawa Valley has a varied history, which includes long periods of successful taro production and tidal waves that destroyed nearly all the homes and the taro lo’i (patches). Today only a few folks make this beautiful valley home, raising tropical flowers and taro. Photo opportunities abound including the small green church and plentiful tropical flora. Location: Follow the Kamehameha V Highway (450) to its end at mile 27. Park your car either at the small county park near the restrooms or continue after the pavement ends for 50 yards to a small parking area by the river. Description: Kalani Pruet grows spectacular tropical flowers on his farm in the lush Halawa Valley and ships them to delighted clients everywhere. He cultivates over 30 varieties of tropicals including a wide variety of ginger, heliconia and calathea. Visit his wonderful flower farm for a free tour. Location: Follow the Kamehameha V Highway (450) to its end at mile 27. Park your car across the little green church and walk past the church down the dirt road about 50 yards. Email Kalani for a tour appointment to be sure he’ll be there.